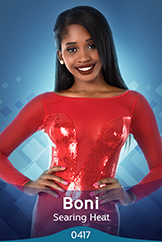 Boni comes from Columbia where she's born in 1999. Boni is a hedonist! She loves dancing, singing, she loves tasting new food and living new experiences... Her career allows her to travel all over the World and meet new people, discover new cultures and she loves it!